The modular composite manifold is used for the control of heating and cooling systems, and can be used for up to 12 circuits. 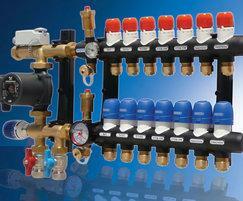 It is available in packs to accommodate all types of underfloor heating project. Control, starter, one- and three-port pack sare available. Packs are assembled to create manifolds with between one and twelve ports. The manifold is suitable for projects ranging from small extensions to new build houses and flats, and can be used with conventional and renewable heat sources. Ancillary components include 22mm isolation valves, a clip-on thermometer, pipe clamps, curved pipe supports, a manifold cover, thermoelectric actuators and control centre and room thermostats.